An increasing fraction of the applications targeted by parallel computers makes heavy use of indirection arrays for indexing data arrays. Such irregular access patterns make it difficult for a compiler to generate efficient parallel code. Previously developed techniques addressing this problem are limited in that they are only applicable for a single level of indirection. However, many codes using sparse data structures access their data through multiple levels of indirection. 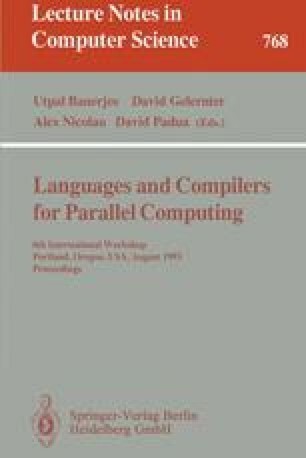 This paper presents a method for transforming programs using multiple levels of indirection into programs with at most one level of indirection, thereby broadening the range of applications that a compiler can parallelize efficiently. A central concept of our algorithm is to perform program slicing on the subscript expressions of the indirect array accesses. Such slices peel off the levels of indirection, one by one, and create opportunities for aggregated data prefetching in between. A slice graph eliminates redundant preprocessing and gives an ordering in which to compute the slices. We present our work in the context of High Performance Fortran; an implementation in a Fortran D prototype compiler is in progress.